I am a little bit of an unusual knitter in that I have a very small yarn stash. Like my entire stash fits into two storage bins (56.7 L) and these bins are not overflowing. Why such a little stash? Well, check out my post No Stash Girl to read the backstory. I also uncovered a very embarrassing bag of what looked like yarn vomit. I immediately shoved this back in the bag to return to its hiding spot in the depths of my stash bin. 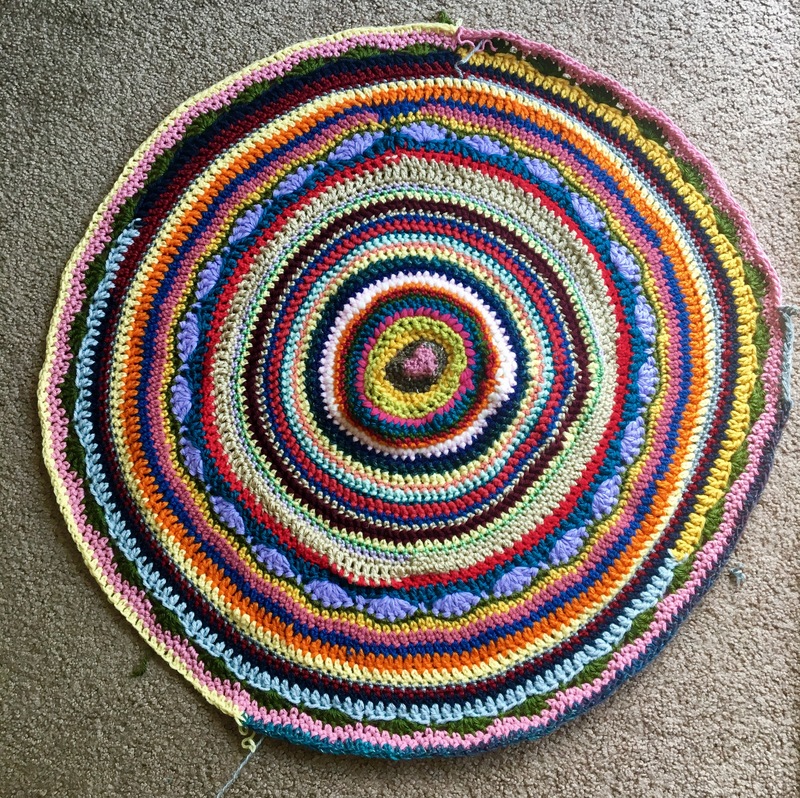 About a year ago, I decided I wanted to crochet another blanket from all my leftovers. Well, let’s just say that the blanket hit a BIG stall. Digging through my stash defiantly revived my commitment to getting it done. Already this weekend I added about two more inches to the blanket. I am not really following a particular design with this one. I am just letting the yarn take me on a journey. So I ask…What does your stash look like? Souvenir yarn is always lovely! I buy souvenir yarn too along with many other yarns that are jut to beautiful to leave at the store. I have yarn for about 2 years worth of knitting projects. Unfortunately, that hasn’t stopped me from buying more. I have a stash but I operate mine on the same principle as you operate your “collection” by setting up some limits. As you’ve mentioned, space is important. I have 6 bins of yarn. If one bin gets roomy and I see a sale, I add some yarn. If all my bins are full I don’t acquire new yarn. I’m a six bin stasher! I’m pretty frugal and only buy yarn on sale, so I need the six bins because I take advantage of sales and stock up when I’m running on the low side. I also budget my yarn spending when I have a bin to fill. I have gone through times when I’ve emptied three bins and kept them that way for months waiting for a coupon or a sale. That is a great idea! Sales are a great way to stock up and keep your hobby cost conscious. Your stash blanket is going to be awesome! ! ! Thanks! I am hoping to get some good progress this week.